At the beginning of the second quarter of 2019, the Financials, Consumer Non-cyclicals, and Telecom Services sectors earn Attractive-or-better ratings. Our sector ratings are based on the normalized aggregation of our stock ratings for every stock in each sector. Our stock ratings are based on five criteria that assess a firm’s business strength and valuation. See last quarter’s Sector Ratings here. Investors looking for sector funds that hold quality stocks should look no further than the Financials and Consumer Non-cyclicals sectors. These sectors house the highest rated funds. Figures 4 through 7 provide more details. The primary driver behind an Attractive fund rating is good portfolio management, or good stock picking, with low total annual costs. First Trust NASDAQ Bank ETF (FTXO) is the top rated Financials fund. It gets our Very Attractive rating by allocating over 40% of its value to Attractive-or-better-rated stocks. Rydex Real Estate Fund (RYREX) is the worst Real Estate fund. It gets our Very Unattractive rating by allocating over 71% of its value to Unattractive-or-worse-rated stocks. Making matters worse, it charges investors annual costs of 8.39%. Figure 3 offers additional details on the quality of the sector funds. Note that the average total annual cost of Very Unattractive funds is over six times that of Very Attractive funds. 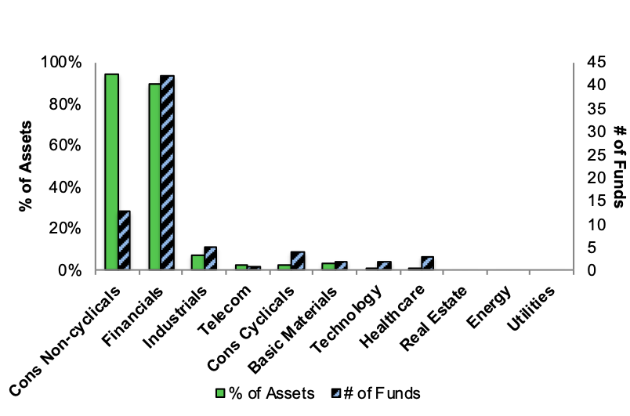 Figure 4 presents a mapping of Very Attractive funds by sector. 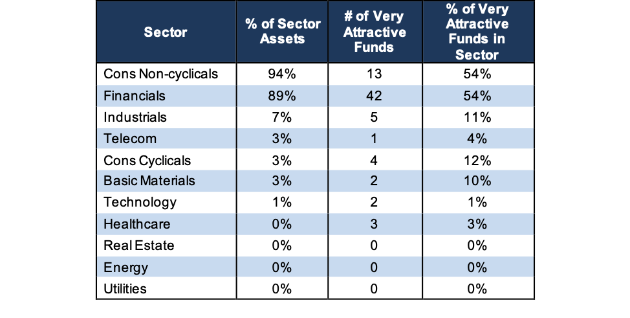 The chart shows the number of Very Attractive funds in each sector and the percentage of assets in each sector allocated Very Attractive-rated funds. 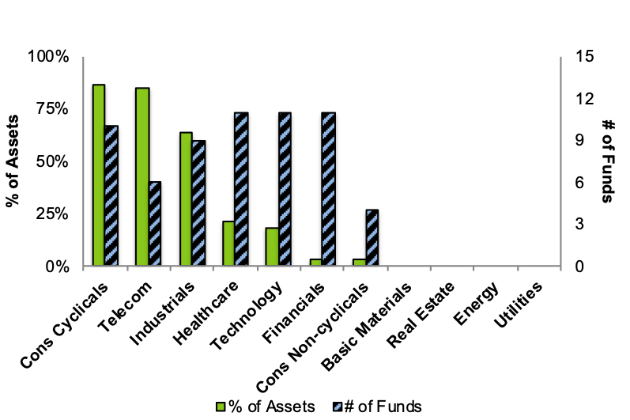 Figure 6 presents a mapping of Attractive funds by sector. 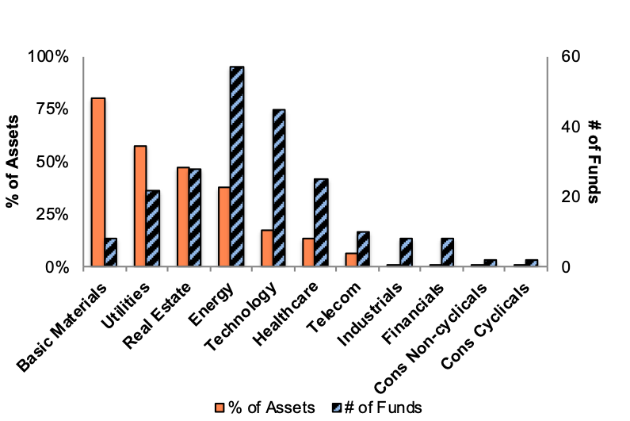 The chart shows the number of Attractive funds in each sector and the percentage of assets in each sector allocated to Attractive-rated funds. Figure 8 presents a mapping of Neutral funds by sector. 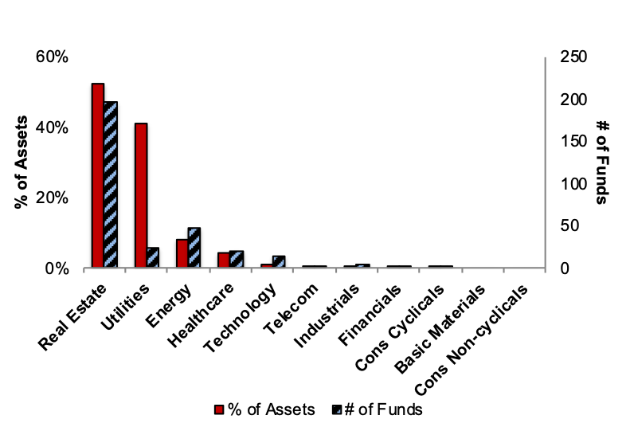 The chart shows the number of Neutral funds in each sector and the percentage of assets in each sector allocated to Neutral-rated funds. 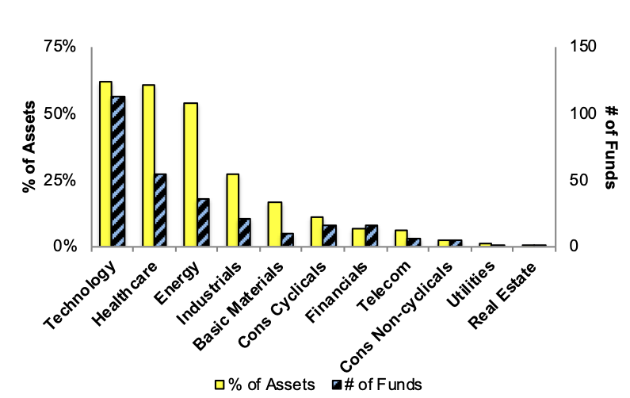 Figure 10 presents a mapping of Unattractive funds by sector. 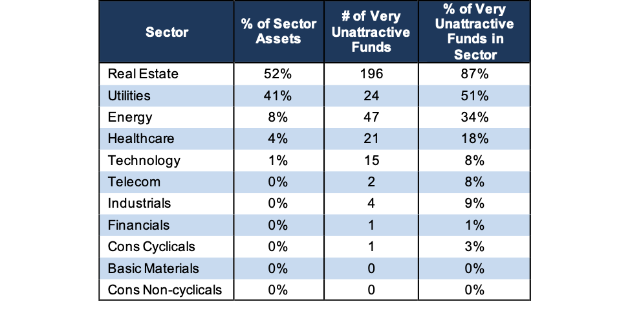 The chart shows the number of Unattractive funds in each sector and the percentage of assets in each sector allocated to Unattractive-rated funds. 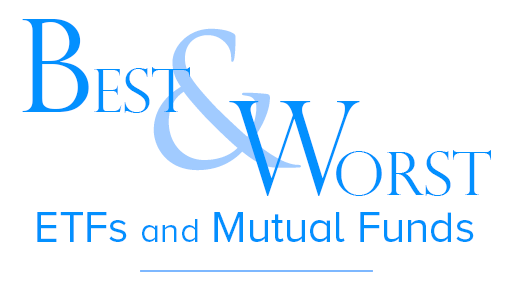 The landscape of sector ETFs and mutual funds is littered with Unattractive funds. 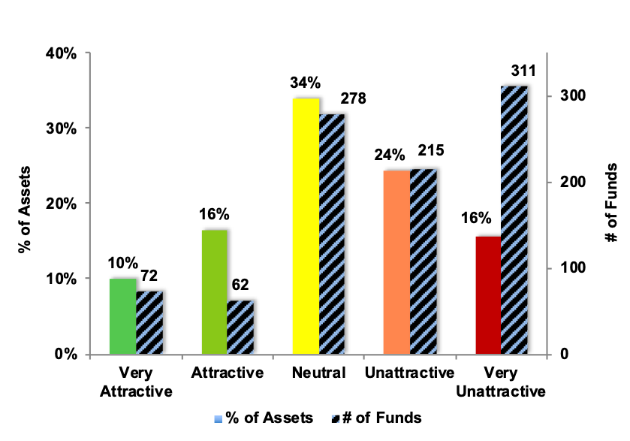 Investors in Basic Materials have put over 80% of their assets in Unattractive-rated funds. Figure 12 presents a mapping of Very Unattractive funds by sector. The chart shows the number of Very Unattractive funds in each sector and the percentage of assets in each sector allocated to Very Unattractive-rated funds. This article originally published on April 10, 2019.